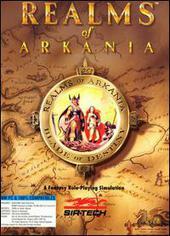 The first game in the Realms of Arkania trilogy. It combines all the best characteristics of that times RPG’s, like an extensive story line, first person view mode, cave exploring, scenery and (of course) freedom over your own actions. This game was an immediate hit when it was first released, forcing the producers to make a new English version almost over night! (The game was originally intended only for Germany). This delayed the sequel to the game, Star Trail, for a whole year. The game is incredibly huge for the time it was made. A lot of work was put into creating the world, including history, geography, folklore, races and NPC’s (non-player characters). The story is epic, as all RPG’s… You play the role of six different people; all looking for adventure and fame that arrives in the city of Thorwal. After a while, you are sent to the real quest of the game: hunt for the sword of legendary warlord Hetman Hyggelik. In order to find it, you will have to travel the world in search for pieces of a map, drawn by one of Hyggelik’s warriors. This map, naturally, shows the location of the sword. This game partially relies on its manual. You will need the manual if you want to make your own characters (recommended), as it holds the minimum requirements in the attribute values of each type of hero.